The electric chair is an execution method in which the person being killed is strapped to a chair and electrocuted through electrodes placed on their body. This execution method is used mostly in the United States, and has become a symbol of the death penalty there. 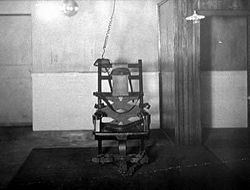 Although introduced in an effort to provide a more humane method of killing the condemned criminals than the previously common hanging, the electric chair itself has been criticized as inhumane. This became of particular concern following reports of electrocutions in which the equipment failed, resulting in prolonged pain and suffering for the prisoners. The introduction of lethal injections, which were either used as an option or replaced the electric chair entirely, depending on the state, was a step in solving this problem. Since the late twentieth century use of the electric chair has been in decline, with Nebraska the last state using solely this method. Additionally, as opposition to the death penalty has increased, with many jurisdictions abolishing this punishment, the age of the electric chair is all but over, marking another significant advance for humankind. The idea of using electric current as a method of execution was developed by Alfred P. Southwick after he witnessed an intoxicated man die after having touched an exposed terminal on a live generator. The first practical electric chair was made by Harold P. Brown, an employee of Thomas Edison, hired for the purpose of researching electrocution and for the development of the electric chair. Since Brown worked for Edison, and Edison promoted Brown's work, the development of the electric chair is often erroneously credited to Edison himself. Brown's design was based on George Westinghouse's use of alternating current (AC), the groundbreaking invention of Nikola Tesla which was then just emerging as the rival to Edison's less transport-efficient direct current (DC), which was further along in commercial development. The decision to use AC was entirely driven by Edison's attempt to claim that AC was more lethal than DC. Edison even proposed that the process of execution by electricity be called not "electrocution," but "Westinghousing." In 1886, New York state established a committee to determine a new, more humane system of execution to replace hanging. Neither Edison nor Westinghouse wanted their electrical system to be chosen because they feared that consumers would not want the same type of electricity in their homes as was used to kill criminals. In order to prove that AC electricity was dangerous and therefore better for executions, Brown and Edison publicly killed many animals with AC. It was at these events that the term "electrocution" was coined. The demonstrations apparently had their intended effects, and the AC electric chair was adopted by the committee in 1889. The first person to be executed via the electric chair was William Kemmler in New York's Auburn Prison on August 6, 1890; the "state electrician" was Edwin Davis. The first woman to be executed in the electric chair was Martha M. Place, executed at Sing Sing Prison on March 20, 1899. It was adopted by Ohio (1897), Massachusetts (1900), New Jersey (1906), and Virginia (1908), and soon became the prevalent method of execution in the United States, replacing hanging. It remained so until the mid-1980s, when lethal injection became widely accepted as an easier and more humane method for conducting judicial executions. In 1900, Charles Justice was a prison inmate at the Ohio State Penitentiary in Columbus. While performing cleaning detail duties in the death chamber, he devised an idea to improve the efficiency of the restraints on the electric chair. He designed metal clamps to replace the leather straps, thus allowing for the inmate to be secured more tautly and minimize the problem of burnt flesh. These revisions were incorporated into the chair and Justice was subsequently paroled from prison. Ironically, he was convicted in a robbery/murder and returned to prison 13 years later under a death sentence. On November 9, 1911, he died in the same electric chair that he had helped to improve. A record was set on July 13, 1928, when seven men were executed, one after another, in the electric chair at Kentucky State Penitentiary in Eddyville. In 1942, six Germans convicted of espionage in the Quirin Case were put to death in the District of Columbia jail electric chair. From 1924 to 1976, the electric chair was used as method of capital punishment in the Philippines. Other than the Philippines, the electric chair has not been widely adopted outside of the United States. The use of the electric chair has declined as legislators sought what they believed to be more humane methods of execution. Lethal injection became the most popular method, helped by newspaper accounts of botched electrocutions. In the state of Florida, on July 8 1999, Allen Lee Davis convicted of murder was executed in the Florida electric chair "Old Sparky." Davis' face was bloodied and photographs taken, which were later posted on the internet. The 1997 execution of Pedro Medina created controversy when flames burst from the inmate's head. Since 2006, lethal injection has been the method of execution used in the state of Florida. The electric chair has also been criticized because of several instances in which the subjects were not instantly killed, but had to be subjected to multiple electric shocks. This led to a call for ending of the practice because many saw it as cruel and unusual punishment. The head and legs of the condemned person are shaved and the prisoner is strapped into the chair. A moist sponge is placed on the head to aid conductivity. One electrode is attached to the head and a second attached to the leg to provide a closed circuit. At least two jolts of an electrical current are applied with the time and current depending on the physical state of the condemned person. Typically, an initial voltage of around 2,000 volts is applied for up to 15 seconds both to induce unconsciousness and to stop the heart. The voltage is then lowered to reduce current flow to approximately 8 amps. The body of the person may heat up to approximately 138°F (59°C), and the electric current will generally cause severe damage to internal organs. In theory, unconsciousness occurs in a fraction of a second. However, there are multiple reports of mishaps during the process. There have been incidents of a person's head on fire; of burning transformers, and of a chair breaking down after the initial jolt and letting the condemned wait in pain on the floor of the execution room while the chair was fixed. In 1946, the electric chair failed to execute Willie Francis, who reportedly shrieked "Stop it! Let me breathe!" as he was being executed. It turned out that the portable electric chair had been improperly set up by an intoxicated trustee. A case was brought before the U.S. Supreme Court (Francis v. Resweber), with lawyers for the condemned arguing that although Francis did not die, he had, in fact, been executed. The argument was rejected on the basis that re-execution did not violate the double jeopardy clause of the 5th Amendment of the US Constitution, and Francis was returned to the electric chair and successfully executed the following year. Regardless of how the execution is performed, cleaning up afterwards is unpleasant. Skin is inevitably burned and prison workers have to separate the burnt skin from the chair's restraints. The initial flow of electric current may cause the person to lose control over many bodily functions, including muscle movement, urination, and defecation. To mitigate this, alterations to modern electric chairs include padding and inertia style retractable restraints. In the late twentieth century, the electric chair was removed as a form of execution in many U.S. states. 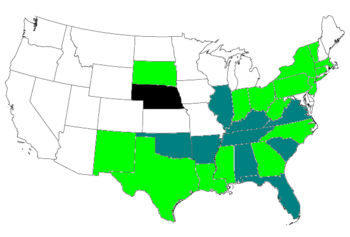 A number of states continued to allow the condemned person to choose between electrocution and lethal injection. James Neil Tucker, after refusing to elect his execution method, was electrocuted in South Carolina in May, 2004. Brandon Hedrick, who elected to use the chair, was electrocuted in Virginia on July 20, 2006. In the states of Kentucky and Tennessee, the electric chair has been retired except for those whose capital crimes were committed prior to legislated dates in 1998. In both Kentucky and Tennessee, the method of execution authorized for crimes committed after these dates is lethal injection. The electric chair is an alternate form of execution approved for potential use in Illinois and Oklahoma if other forms of execution are found unconstitutional in the state at the time of execution. In Florida, the condemned may choose death by electrocution, but the default is lethal injection. ↑ Christen, A.G. and J.A. Christen. Alfred P. Southwick, MDS, DDS: Dental Practitioner, Educator and Originator of Electrical Executions. Journal of the History of Dentistry 48(3). Nov 2000:117-22. ↑ Bellis, Mary. The History of the Electric Chair. Retrieved May 22, 2007. ↑ Citizens United for Alternatives to the Death Penalty. "Politics, money, and a simple sense of fairness" Retrieved April 14, 2007. ↑ Encyclopedia Britannica. Electrocution. Retrieved April 21, 2007. ↑ Capital Defense Weekly. The Shocking Truth About Death in the Electric Chair Retrieved April 14, 2007. ↑ U.S. Supreme Court case, Francis v. Resweber: 329 U.S. 459 (1947) Retrieved April 25, 2007. ↑ Fox News. Virginia Death Row Inmate Chooses Electric Chair as Execution Method. Retrieved April 14, 2007. ↑ Death Penalty Information Center. Methods of Execution. Retrieved April 14, 2007. This page was last modified on 18 September 2017, at 21:53.